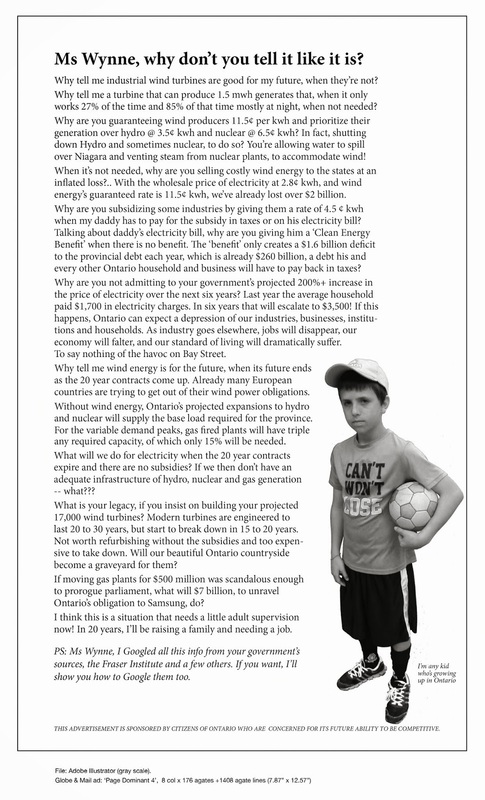 Tradegy & Farce of Ontario’s Energy | Mothers Against Wind Turbines Inc.
Nearly six years ago, Ms. Wynne’s predecessor, Dalton McGuinty, was facing an election. He was, like the current premier, spooked by rapidly rising electricity prices. These spiking prices, note well, had been engineered by the Liberal government’s mishandled Green Energy policy. To win back voters, Mr. McGuinty decided to give consumers a break. The tool: the so-called Ontario Clean Energy Benefit, which ran from the start of 2011 to the end of 2015…. The present distorted energy sector is the inevitable result of having an unemployed Ottawa lawyer and Toronto school trustee design your energy grid. At NO point did this Liberal regime consult with the province’s professional engineers, or follow their recommendations. Instead, they followed the recommendations given by a motley crew of “green” environmentalists and natural gas industry executives. What is needed immediately is a moratorium on the construction of wind/solar power projects. The next step would be a police investigation of the companies involved in the “green” industry to identify the true owners / financial backers of these businesses as well as their relationships with the Liberal party. I would recommend that the RCMP carry out this investigation with the help of Interpol.